RATES-From-$80 nightly for 2 guests- $10 additional per person. 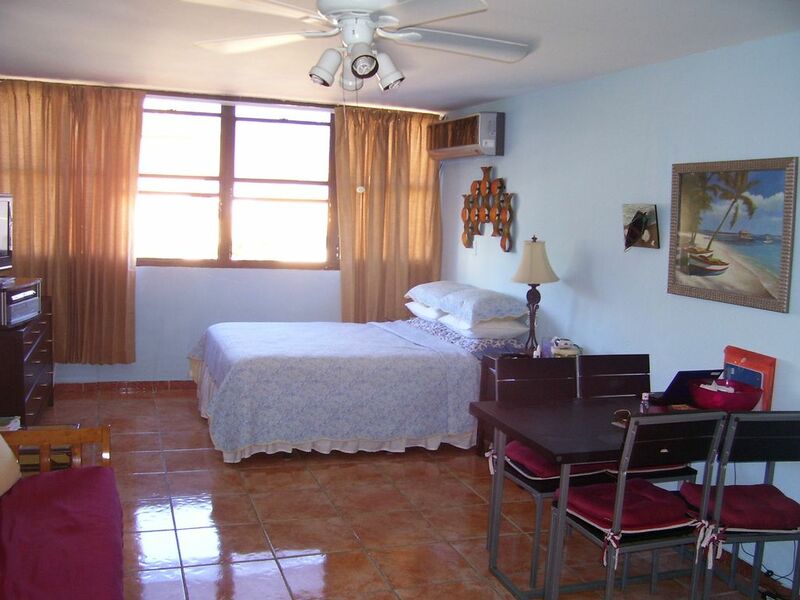 -Located just off the main strip (Ave. Isla Verde). -Corner room provides extra living space with open door and windows you can receive the cool breezes of the day. -Walk to San Juan Hotel/Casino & Ritz Carlton Hotel/Casino-where you can listen and dance to free live bands on weekends. -Abundant Restaurants/Sports Bars and Supermarket a short walk away. -Apt. is right above swimming pool area. What better place to own, than where the sun always shines and the beach is there to enjoy. My wife was born in Fajardo, Puerto Rico and I am of Puerto Rican parents born in New York. We both have always loved the island and it is our second home but first love. Area is the Hot Spot for tourists with the San Juan Hotel/Casino, Ritz Carton Hotel/Casino and Court Yard Marriot Hotel/Casino within a short walk. DVD/VHS movies in room for your use. Security system at entrance and pool area. Disfrutamos mucho de este rinconcinto. Muy apropiado y acogedor. esta centrico a todo Isla Verde. Great price for the convenient location near beautiful beaches and fine dining. Very walkable area to grocery store and everything! Nice pool, gated parking, and great A/C. The bed was very comfortable and there are lots of good movies to choose from if you like to relax before bed. Very happy with my choice. I stayed here with two friends for about a week and we all had a blast. Kitchen was just enough for our purposes, and the 2m walk to the beach was a real plus. Really convenient location otherwise, close to the old town and airport. The owner Bill was really helpful throughout the entire process. Thanks-Glad you enjoyed our apt. This cozy condo was perfect! It had everything I needed for a weeklong stay. The condo building itself is very quiet and has a beautiful pool, which was very rarely used by anyone else. Its also a quick walk to the beach. Hotels, restaurants, and supermarkets are also within walking distance so I didn't need a car. Bill was amazing and was very responsive and always available if I had any questions. There was a review on here that mentioned it was like staying at a relatives condo and I agree. There was a sense of warmth in this condo. It was very clean and has exactly what you need. I came from NY (very stressed) and as soon as I got there, I immediately relaxed. This was a wonderful vacation and I will definitely be coming back and renting this condo again! This was my first time using VRBO and my first time to Puerto Rico, so I was a little hesitant about the whole process. Bill was great to work with! He promptly answered all my questions, put my mind at ease and lived up to all aspects of the rental process. The condo was exactly as described: clean, comfortable and a great location along the Isla Verde strip. We especially enjoyed the book and movie selection! :) I would highly recommend Bill's condo to anyone looking for an affordable, clean place to stay close to the beach, restaurants and shopping. REDUCED RATES FOR EXTENDED STAY . (OVER 6 NIGHTS) ADD $10 PER PERSON, PER NIGHT FOR 3RD OR ADDITIONAL PERSON.